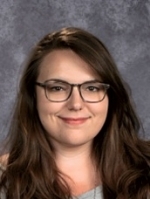 Ms. Augensen works with 3rd–5th grade and completed her bachelor’s degree at ROchester Institute of Technology where she studied photography and writing. She then attended graduate school at Ohio State University where she studied arts policy and administration with a specialization in museum education. In her free itme, Ms. Augensen loves cooking, going to the beach, taking photographs, and spending time with her fluffy sassy grey cat named Mini!